Resene ColorShop/DIY Cardholder special offers. ColorShop/DIY Cardholder specials - The ultimate decorating card just got better! As well as the discounts on purchases at Resene ColorShops, you can now present your Resene ColorShop/DIY Card elsewhere and enjoy discounts on a range of products and services. 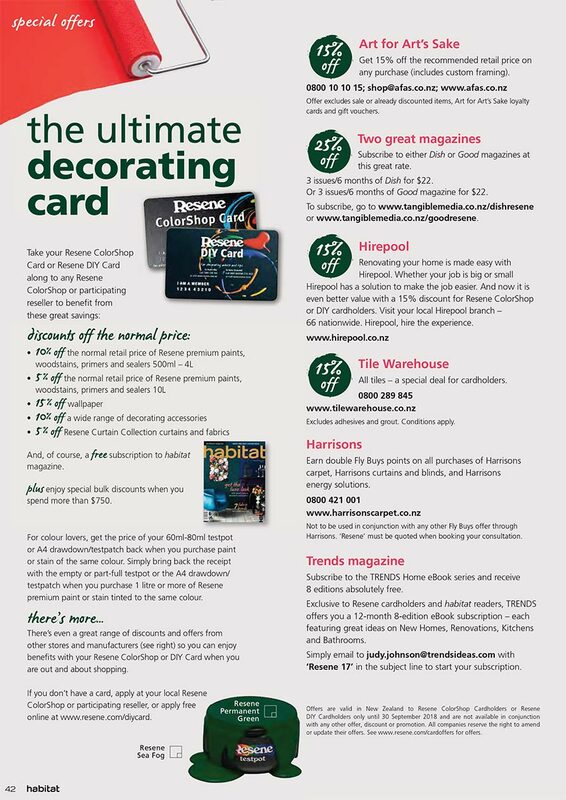 Simply present your Resene ColorShop/DIY Card or quote your card number to take advantage of these great offers. All companies reserve the right to amend or update their offers at any time. We recommend you print out the offer you are interested in and have it with you when you are ready to make your purchase to ensure that both parties are referring to the same special offer. View current Resene ColorShop/DIY Cardholder special offers. You will need Acrobat Reader. If you haven't got your Resene ColorShop/DIY Card yet - join up online.